No one is sadder than I am that I did not enjoy Illuminae. I have THREE copies of the book, mainly bought because I couldn’t wait to get started! This is coming from a girl who never bothers to buy physical copies (my existence is held together by a Kindle). Image credit goes to Freepik, edited by me. I can’t say it’s a complete waste because the book itself is GORGEOUS. The designers and authors deserve much credit for tying the story together in such a visually stunning manner. Yet, that’s about all the positives I have on Illuminae. As you all know, Illuminae is a book surrounded by immense hype and built up by an army of ringing endorsements. By the end of BEA 2015, I was convinced 70% of bloggers in US have read the book, and they all seem to agree it’s the best thing in fiction since Harry Potter. In general, I’m 50-50 with popular books – I either lap it up and turn into a crazy fangirl along with the adoring public (see Six of Crows, or Throne of Glass from book 3 onwards) – or I just feel underwhelmed. Unfortunately, the latter happened here. I built up too much expectations, and what I got in return is a fairly standard YA scifi – complete with obligatory romance and sketchy world building. It sets itself apart by being brilliantly marketed and packaged, though I don’t feel it’s enough for me to award it more than 3.5 stars. With science fiction, as with every other genre – what I look for as a reader is creativity plot wise. Illuminae did not introduce anything I haven’t seen before, and it did not deal with any of the issues it raised in an interesting manner. Even the ending twist was more than a tad predictable. I also look for emotional weight and connection to the characters, both Ezra and Kady fell flat for me. I think this is largely due to the epistolary format of the book – I despise reading chat logs, especially ones littered with what’s meant to be “teenage speak”. I don’t know any teens that chats like this – and I’m a freaking YA blogger! There were some similarities between the premise, but I brushed it aside because it’s also the premise of every space opera ever. In BSG, the Cylon wipes out the ENTIRE human race, and the survivors scramble through space to evade Cylons and permanent extinction. In Illuminae, an evil megaconglomerate wipes out an ENTIRE planet, and the survivors scramble through space to evade their attackers. The Olympic Carrier in Battlestar Galactica (S1 Episode 1) VS Copernicus in Illuminae. In BSG, our heroes had to shoot down Olympic Carrier – a commercial civilian vessel – due to orders from their President: whether the ships had any human passengers was left ambiguous. 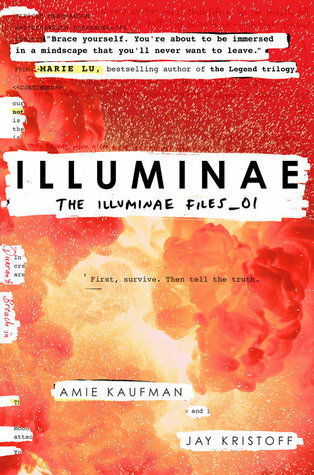 In Illuminae, Ezra and his team was told to shoot down Copernicus – a civilian vessel – due to orders from AIDAN: they were left wondering whether there’s any civilians on the craft. AIDAN is an artificial intelligence running the Alexander. It spews pseudo philosophical nonsense along with random techy gibberish at times. The Hybrid is an artificial intelligence controlling the Cylon’s basestars. It spews pseudo philosophical nonsense along with techy gibberish all the time. So yes, I got supremely sidetracked by all the similarities, they just niggled at me throughout the book. I think I would have enjoyed Illuminae more if I haven’t seen BSG. The book was driven mainly be romance, and not even a good one. It did not help that I thought one of the main character is an idiot, while I had no attachment to the other. If I never have to see another ‘teenage chat convo’ again, it would be too soon. All the chats were a freaking pain to read through, I dearly wanted to skip them. Unfortunately, they were the ONLY place any actual character interaction took place, so I had to hang on tight in the hopes I would begin caring. In the end, I just got more annoyed. I thought Nicola Yoon did a fine job in Everything, Everything displaying a young couple falling in love via chat in her book. However, I don’t think Ezra or Kady’s relationship meant anything more to me than just a couple of words arranged into pretty pictures on a screen. I did think that the second half of the book was a huge improvement from the first half, because of the relative disappearance of characters I found annoying. I think my favourite character in this book was AIDAN, and I liked the direction the story took with him – even though, again, it was nothing original. The world building was paper thin in this book – I knew nothing about this universe, the world we saw was confined to chat screens and a couple of rooms in the spaceships. I don’t know how ANYTHING on the vessel even works?! Or how large their world is? Or why in a universe with super intelligent AI and spaceships, we still had humans using primitive chats that were lesser than MSN messenger (I just really freaking hated the chats, ok). If I didn’t hear five months’ worth of ‘this book is the best ever’, I think I would have judged Illuminae less harshly. Blame it on hype fatigue, but this book was one massive disappointment. Despite all the beautiful designs, Illuminae lacked plot or emotion that could hook me. I think I’ll be giving its sequels a wide berth. Okay, I’ve never seen BattleStar Galactica, but the similarities you mentioned are way too similar!! If I was familiar with the plot of BSG, I would’ve been annoyed as hell! I didn’t have the same problem with the romance (LOVE YOUR HEART THING THOUGH), but I agree with the primitive nature of the chats. I was like… surely with 500 years of improvement, you would have better emoticons?! I was expecting super elaborate ones! That’s why I was so annoyed at Illuminae, I felt it took too much from other work and could barely stand on its own without the pretty designs. I have low tolerance for most YA romance in general though – I now remember why I run from most Ctr contemporaries like the plague. Hopefully the next books are better. I just want to see some actual world building. I just don’t like chat speak, I AM SORRY. 3 stars was for the book design because omg it’s so gorgeous though. So I haven’t read this one yet – mainly because I too survive on my Kindle and know I would have to get the hard copy of it. I am really glad to see this review though. I like when I can see why someone doesn’t like the super popular book. Love all your graphics throughout the review!! Sorry this one didn’t live up to the incredible hype for you – Great review! Thanks Grace, I hope you get a chance to try it for yourself soon! As everyone else does seem to love it haha. Aww it’s too bad this book didn’t hold up to its popularity. I totally won’t enjoy a book that feels like a carbon copy of something else too, so I understand your frustration. Thank you, the graphics in here are 100% inspired by the pages in Illuminae so if you like them you should consider getting the book — even though I was just lukewarm on the actual content. You should still give it a go. I’m definitely in the minority w this one! I will. Still it’s good to have an expectation. Thanks for your review! I think your rating is generous enough. I haven’t read the book, but I am actually excited for it. Hopefully, it surpasses my expectations, but sometimes, too much hype dampens the reader’s reading experience. My rating mostly reflect how I feel about the book design which was a feat in itself. I hope you end up enjoying it- just hold expectations in check! I bought this, SO excited to read it, and now I am worried. I’m a big sci-fi freak (Star Trek, BSG, Firefly, Star Wars), so I am sure that I will notice the similarities as well. Argh! Thank you for the warning – I will try to temper my expectations going into it. I would be interested to see what you think of it, as a fan of scifi! I think you might still enjoy it if it makes you feel nostalgic? I will read it and let you know – maybe I just need to approach it that way, with curiosity to see how it fits in. Thanks for the idea! Thank you Nick! I can completely understand why you yourself adore the book, though! Thanks Ashley. If you like my graphics in this post you should check out the book because they’re inspired by pages from it. The designs are gorgeous!! I would still check it out as it’s quite unique to the YA genre!! I’m sorry to hear you didn’t like Illuminae. For me this book gave me all the Battlestar Galactica feels but in the best way. Yes there are similarities but that happens a lot in the SciFi genre as a whole. I do understand your points though. It also helps that I discovered Illuminae right before its release so the major hype didn’t affect me. Ahhh I am glad you enjoyed it!! I think it’s because I watched BSG quite recently so it’s all fresh in my mind haha. I just wanted the book to be more unique as there was SO much hype. I totally get it! If Netflix had still had BSG I probably would have immediately rewatched it. Your review was spot on, and I had pretty much the exact same thoughts on it, especially about the predictability of the ending and the romance. Oy, and the writing style with all of the logs and text made it so hard to connect with any of the characters; the black and gray pages, however, were a work of art and very unique from anything I’ve seen in YA. 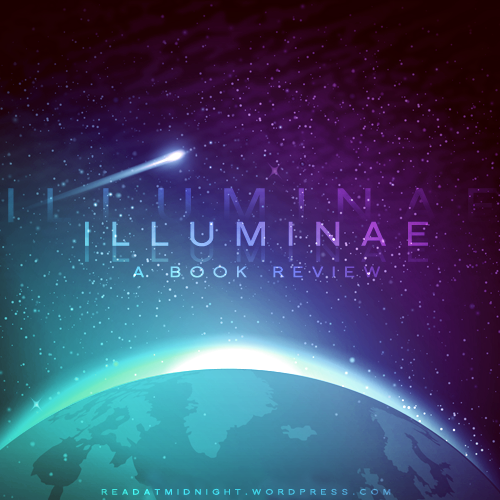 I loved the cover and page artwork of “Illuminae,” but that was about it. I’m happy to know I’m not the only one out there who wasn’t a fan of this book. Great review! P.S. If you’re looking for a great sci-fy series, read Amie Kaufman’s and Meagan Spooner’s “Starbound” books (if you haven’t already read them). They are some of the best and most enjoyable alien science-fiction I’ve found. The book is certainly unique presentation wise. I just wished it brought the A game plot and character development wise as well. But I guess I’m just one of those people that can’t connect to epistolary novels. I have the first of the Starbound series and can’t wait to read it! I completely agree with you! It’s visually gorgeous and creative, but I didn’t get wrapped up in the story because, like you said, it had kind of an epistolary style of writing. I agree with your thoughts on the characters, I didn’t connect with them much but I did get hooked on the plot. I’m not a huge science person so luckily I didn’t feel like I had read it before. Ooh this is interesting! You’re the first person I’ve found who isn’t a fan of this book. My entire feed is Illuminae reviews today. Oh no!! I actually found Baltar and Six hilarious haha! I think you might end up liking Illuminae- it’s like a less extravagant version of BSG – definitely no crazy Cylon hallucinations here. I have this one on my shelf but haven’t picked it up yet. I didn’t realize that it dealt so heavily on the romance side of things, so I guess I’m somewhat bummed out about that aspect. I was hoping it would be a lot more science fiction-y and less romance-y. Eh. I’ll probably read it soon, but I liked reading your review. I hope you end up enjoying it Kelly 🙂 I was also surprised to see so much romance as I didn’t expect it from the blurb. I’m sorry you didn’t enjoy this one as much as everyone else did! I haven’t read it yet, but it seems at almost everyone absolutely adores it. The hype is so big, it’s kind of scary! Your review has made be a bit cautious to read this now, because usually I disagree with the hype in books like this. I’m not sure when I’ll be picking it up. I still hope you end up enjoying it! Should definitely give it a go as the format is quite unique! Oh my. It’s the first “negative” review I read about this book. I may think twice before buying it, thanks ! I loved your review, it was very well explained, all the reasons why you didn’t enjoy it as much as you wanted to ! I think that you should still get it as I’m definitely in the minority with my views haha! So sorry that you didn’t love this book! I’ve never seen BSG, although I definitely noted similarities between Illuminae and other scifi. But I’m definitely a visual person, so I got a lot of pleasure from the typography while reading, including the chat logs and other communications. Maybe Book 2 will improve plot-wise? I hope so, though I’ll probably wait for reviews from people I trust before buying three copies of the book like I did with this one haha. From some of the things you’ve said about your book tastes, I had a feeling this one might not work as well for you, but your rating was actually higher than I though it would be! In my review I also made a comparison to BSG – because the countdown reminded me of the whiteboard scenes! Good to see I wasn’t just nitpicking and you saw the similarities too haha. Jay Kristoff actually said this book is BSG meets 10 Things I Hate About You so I’m not even surprised. Aw I’m sad you didn’t love it! I’ll be picking it up soon after I finish a few more books:) I’ll let you know what I think. OMG I love you even more, are we the same person????? I now know who I can trust for sci-fi YA recommendations ;-). I only saw the first few episodes of BSG since it started depressing me at a time when I couldn’t handle that, but that is probably where some of my deja vu came from! I nominate that you read the next book first before I have to decide whether I should buy it 😉 I WILL ONLY TRUST YOU!! I’d actually wanted to request this on NG, especially after seeing the flourish of positive reviews but I just felt like it wasn’t for me. It seems too dystopian for me. If that makes sense? It is a bit of a dystopia I guess. But honestly the world building is so sketchy I can only characterise it as pseudo scifi with a heavy dose of romance. It’s not very heavy on the space side of thing. a lot of the book is actually dialogue, so I hope you will find it enjoyable! Yes I hope so as well! How did you find the writing style? It’s nice to see a review on this under 5 stars. This book is intimidating for me, mostly because of the size and the hype. But I saw it at Target yesterday and holy hell, that is one hell of a pretty book! It’s actually a really quick read because most of it is pictures! Or really large print haha. I would recommend trying it as it is uniquely presented. I’ve been seeing a lot of glowimg reviews on this everywhere. It’s a book that everyone seems to want or have read already. I’m pretty sure the dog across the street has a copy of this book. The hype is soooo loud for this one. I pretty much gave all the reviews an arm length distance for fear of spoilers and to be honest, I was afraid of letting those positivity get in the way. I might have high hopes for this one but I find your points to be super legitimate so I’m lowering down my expectations. I’m not a big fan of sci fi but when you said the world building is paper thin, that snagged something inside me. WORLD BUILDING IN A SCI FI WORLD IS VERY VERY IMPORTANT! Right?! I felt everyone had read this book FIVE MONTHS AGO hahaha. I guess the buzz died down for me, coupled with the disappointment in the lack of originality in the plot line, turned my review a little mean? I still hope you enjoy it though!! I think you should still check it out for yourself from the library at least- since the book is generating a lot of conversation and interest in scifi! I’m from Germany, they don’t have a lot of English books 😦 But that’s okay, there are tons of books I’m way more interested in. I rated it nicely mainly on design haha. But at least now you know you should go watch BSG ASAP! If you liked the book you will probably like the show! There’s too many shows to watch! Haha just like how there’s too many books to read! I just started Supernatural actually. I’m still on the fence about this book, Aentee. It looks like this book loses a lot in e-book format, and I’m not sure I’m interested enough to buy a physical copy. What makes me really sad is nowadays the content of the book is not important, it’s all about marketing. It’s great when the hype surrounds a book that deserves it, unfortunately often it’s not. Like you I want to be connected with characters in books, and I personally find hard to do it with epistolary format. I also so relate to “judging hyped books more harshly”. When expectations are high, disappointment is great. Great review! Oh no. I have only today found out about this book and actually read synopsis (how did I not notice the hype is beyond me) and went on a look out for reviews. I am super intrigued by the format of this book but “obligatory romance and sketchy world building” scares me. What to do? I may probably buy copy just for visual purposes, lol. Anyway, thanks for sharing your thoughts, Aentee. It helped a lot!